Seegatesite.com – development of technology to bring convenience to everyone, a lot of development are deliberately created so that all of them can be used in a more practical, as well as smart devices that can perform a search simply by using voice on smartphones such as Google Now, Siri, Cortana. In this mobilegeddon era, applications such as Google Now, Siri and Cortana is very easy for the user to perform a search simply by saying a keyword without the need to type. And how to add voice search on WordPress? With WordPress you are very likely to add the feature. A voice search plugin can help you to get the facility of voice search on WordPress easily. How to install voice search on wordpress site ? To add a voice search on a WordPress site, you need to install and activate the wordpress plugin called Voice Search . Voice search is a plugin developed by Pascal Birchler . Once the plugin is active, we don’t need to configure the settings of the voice search plugin . You only need to add voice search widget from the menu Appearance » Widgets. Then drag and drop default search bar widget to the sidebar. If you already have a wordpress default search widget on the sidebar, the plugin will automatically add the microphone icon in the search bar on your WordPress site. Further to try this plugin please refer to your site and find the microphone icon that has been added in the search box of your WordPress. 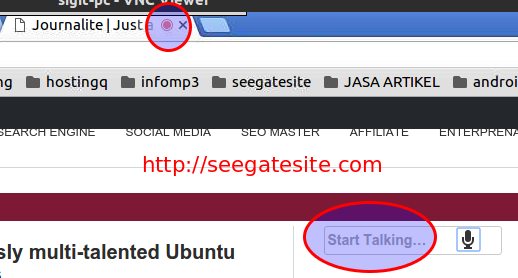 To use Click the microphone icon it will automatically display the text “Start Talking” and please you pronounce the keywords you want to search on your WordPress site. You need to know today plugin Voice Search only works in Safari and Chrome browsers. For Mozilla Firefox reportedly still will add voice search option in the near future.